Cookie dough!!! I can remember sitting and eating tubes of the stuff when I was in college. . . . . . . even after I was in college. . . . . when I should have known better. But do we ever really get over wanting to eat the yummy stuff? I don't know. I do know I haven't eaten raw cookie dough in a while. This is a slightly better for you version. 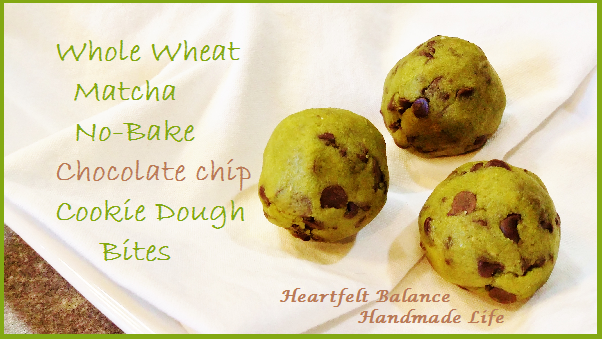 It's made with whole wheat flour (a kitchen pantry staple in our home! 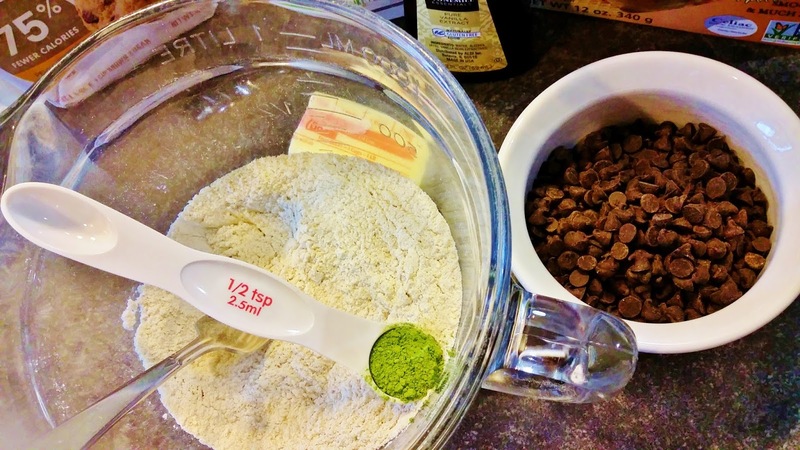 ), a little ground flax seed, matcha green tea powder and Truvia baking blend and Truvia brown sugar blend (things that SHOULD be kitchen pantry staples in our house). BUT, it also has butter and chocolate chips. So, it's lower in sugar and higher in fiber than normal cookie dough, but it still has all the fat of the butter and chocolate chips. So. . . . . . . . . . . The good thing about these is that they don't have any raw egg in them if you're worried about that when eating cookie dough. I'll tell you how I made them and you can decide for yourself whether or not they fit into your diet or lifestyle or whatever you want to call it! I do have to say that my usually picky eater who probably wouldn't normally touch anything green AND doesn't like most things with chocolate chips in them LOVED these! So, score one for mom! Cream together the butter, Truvia sugar blends, vanilla and water. 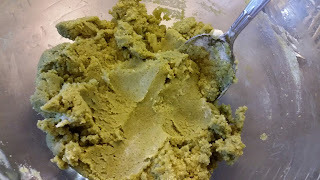 In a separate bowl whisk together the flour, ground flax seed, matcha powder and salt. 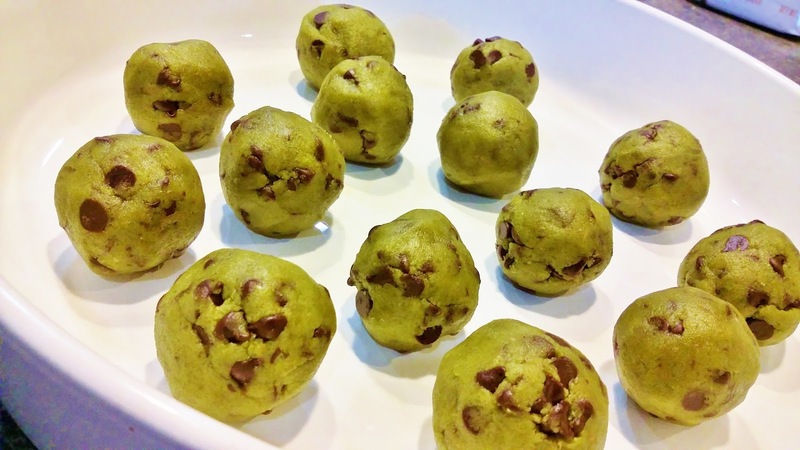 Mix wet and dry ingredients together until they form a cookie dough consistency and fold in the chocolate chips. Roll into balls using about a heaping tablespoon of dough for each ball. Place balls on plate and refrigerate for a half hour. It made 14 balls. Have you ever made cookie dough bites before? What's your favorite kind of cookie dough to eat? The only times I have made cookie dough is when I've attempted to make chocolate chip cookies, but they always fail. 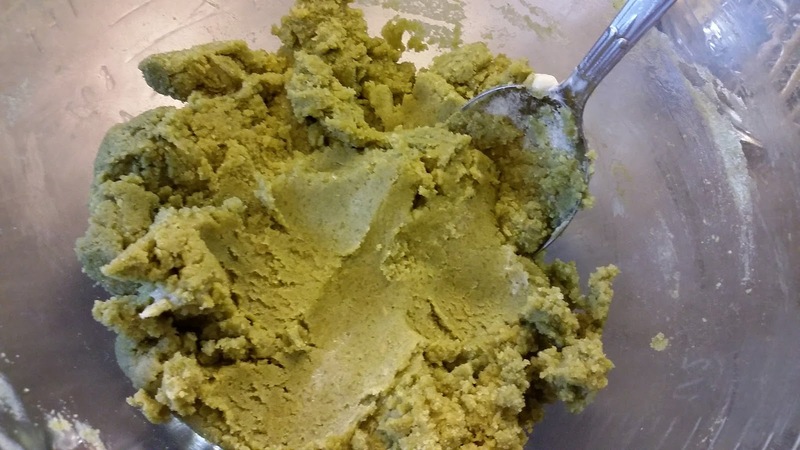 I don't usually eat raw cookie dough, but this recipe sounds interesting.